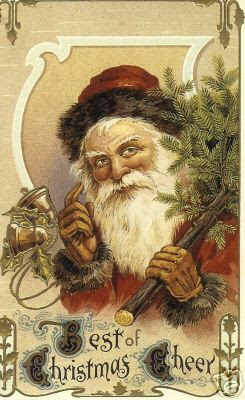 ~ Cider Antiques ~: Merry Christmas ! Wishing my friends in Blogland a very Merry Christmas and all the best for 2009! We had a great weekend in Toronto with family and managed to miss the snow storms that dropped 10 inches on Friday and another 6 inches on Sunday. We drove on Saturday and Monday, LOL. Here is a picture of the local park near our relatives in Brampton, Ontario (just north of Toronto). 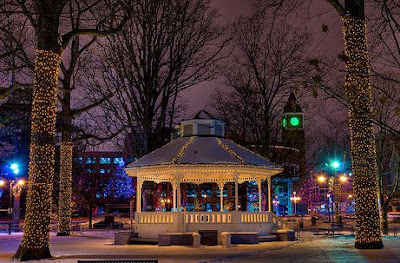 The Gazebo is so pretty with all the Christmas lights and sparkle. There is actually a circular skating rink around the park, but we didn't make it out there this year (just too cold). Sure looks pretty though! ~ Christmas Eve ~ Whew! Thank you for all the kind comments on the Mink Teddy Bear. Glad your parcel arrived on time! It was lovely to see all of you o Monday. Have a fabulous Christmas and talk to you soon. So glad your little bear arrived in time! Wishing you and your family a very Merry Christmas and a wonderful holiday! I'm looking forward to chatting in the New Year! All the best for 2009! Christmas for us I'm afraid. Have a wonderful day with your family. What a magical picture and must be so lovely to be there. Wishing you and the family a great holiday and all the very best for 2009. Oh how pretty and romantic looking. I've seen that card before. I love the old vintage type Christmas cards. They just had so much more character and charm to them.